Planning a new website is fun and everyone gets quite eager to get rolling with things. In the website redesign process, there are times that important steps are forgotten. Each step should be discussed internally and with your web development vendor of choice. One step that is often dismissed or not discussed enough is usability. There is always so much focus on design and administrative functionality, sometimes the user is forgotten. You already know everything about your business and you've been thinking about this website for awhile, try thinking about this as your potential customers would...preferably your dumbest potential customer. Why are people coming to your site in the first place? Are they looking for general information, are they buying something, are they subscribing to something? 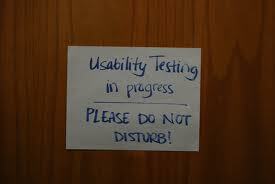 This should be the first question you ask yourself in regards to usability. Your business' primary revenue generator from your website is selling beef jerky online across the world. But a small part of your business sells wholesale meats to stores and restaurants in Olean, NY. Maybe 5% of your website traffic is related to wholesale meat sales in Olean, NY and you have no plans on expanding your business in that area. In this scenario, the vast majority of your content should be related to beef jerky and making it extremely easy for a buyer to purchase it without having to navigate around any information about wholesale meat. Sometimes over segmenting your website content can be just as confusing, but if it makes sense, serve your content and navigation structure based on what your audience is looking for. Think about your navigation. The standard Home, About, Product, Capabilities, Contact should not be a default. If you can distance yourself from this, do it. Again, take yourself outside of the project and think about how a website visitor should navigate the site. There is no need to clutter your navigation if you don't have to. Make it down to the point and utilize easy to understand. Clever is nice if you are the person creating it...clever is not always easily understood though. Use CTAs (calls-to-action) where appropriate. If there is an action item that people are coming to your site to do, use a CTA to make it easy for them to find. Think about what action items will be taking place on the site and detail them for your website designer. Sometimes even after trying, people cannot think about their project as an outsider. If you feel like that is proving to be difficult, don't be shy...ask friends, family, or even better create a focus group and start to gather some really great information. Take good notes as this will not only be beneficial with your website usability, but also can be used in future marketing. Design is important, but not so important that it makes your website unusable. Colors, font, imagery, etc, should all be thought of from a design and usability perspective in any website redesign process. Be sure that this is clear to your website designer. These are the items that should be thought about and discussed in your website planning phase and preferably before you create your website RFP. There is even more that goes into usability once you start the build-out of the site, but having these items planned out in advance will make the overall usability aspect of your site go much smoother down the road.